The ferret (Mustela putorius furo) is the domesticated form of the wild European ferret or polecat (M. putorius). It is often considered as a subspecies (and furo added to the scientific name) because it has been domesticated for hundreds of years. However, genetically the domestic and wild ferret are identical and are therefore treated as one species. The ferret is not native to Australia but is kept here as a pet. It has potential to establish populations in Australia and become a pest. 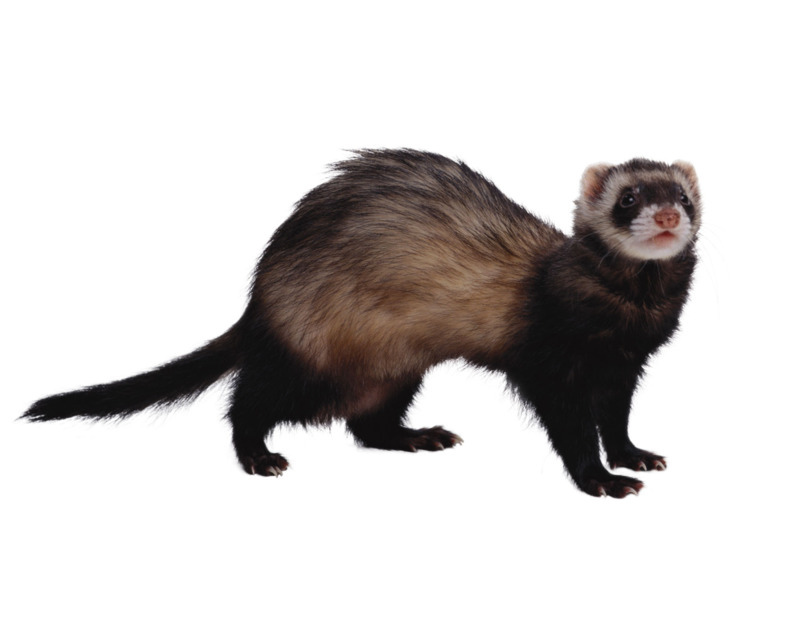 The ferret has a long, narrow body from 20-46cm in length, a tail from 7-14cm long, and short legs. It generally has a dark brown to black body with pale yellow underfur and longer, black-tipped guard hairs. The tail is black and looks bushy. The face is greyish-white with dark areas, giving the face a masked appearance, but this can be absent in some pet animals. The brownish colours are referred to as ‘sable’ and are the most common; other less common colours include silver, chocolate and white (with dark or red eyes). Immature ferrets look similar to adults. Common brushtail possum (occurs throughout Australia). Brown bandicoots (two species that occur in northern, north-eastern and southern Australia including Tasmania). Quolls (four species, each with separate distributions in northern, south-western, and eastern Australia including Tasmania).